Teeth are formed of two main parts: the crown (the visible protruding part) and one or several roots (the part inserted in the maxilla). 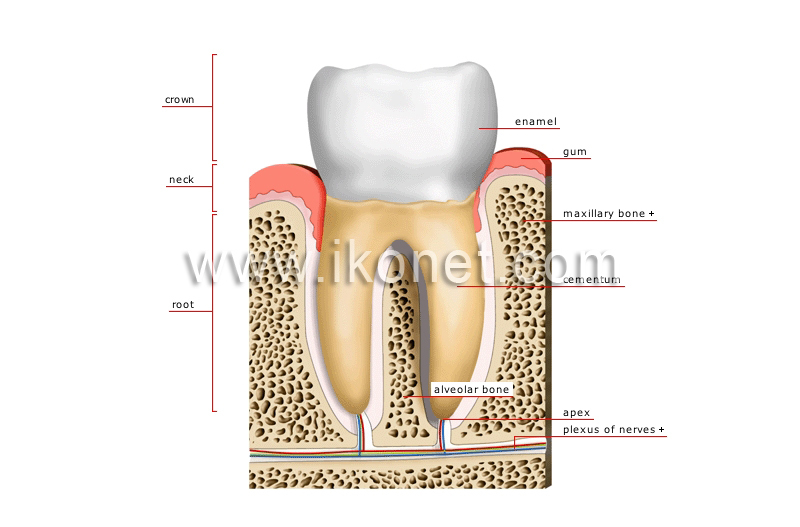 Highly mineralized tissue covering and protecting the dentin of the crown; it is the hardest tissue in the organism. Part of the tooth covered with enamel and protruding outside the gum. Narrow part of the tooth surrounded by the gum separating the crown from the root. Hard mineralized tissue comparable to bone covering and protecting the dentin of the root. Part of the tooth covered with cementum, and implanted into the dental alveolus of the maxilla; certain teeth, such as the molars, have several roots. Section of the maxilla bone surrounding the dental alveola; its presence depends on the presence of teeth: it forms and disappears when they do. Grouping of blood vessels and nerves that enters the pulp through the apical foramen to nourish the tooth. Terminal part of the dental root whose opening (apical foramen) allows blood vessels and nerves to pass through. Jawbone into which the teeth are inserted. Thick section of the mucous membrane of the mouth that is rich in blood vessels and nerves; it covers the edge of the dental alveolus and adheres to the neck.